45 calibre Dhanush 155 mm Gun and Upgunned 45 Calibre 155mm Dhanush howitzer. 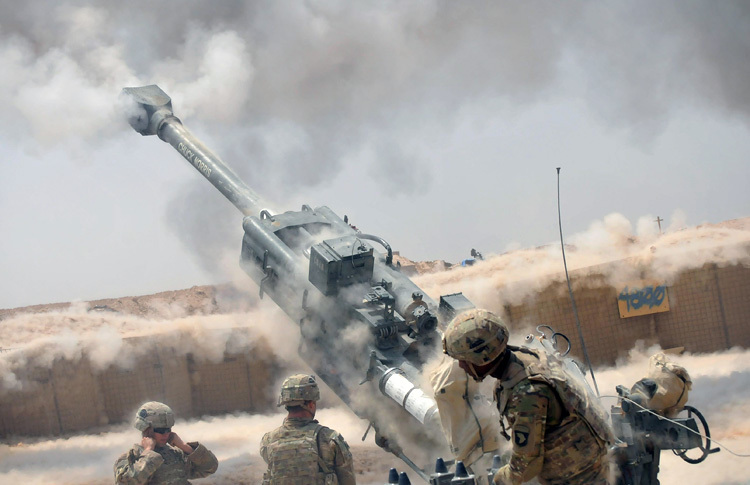 The Army is currently in the process of inducting 145 x M777 Ultra Lightweight Howitzers from BAE Systems (USA) at a cost of about $750 million. K-9 Vajra-T 155 mm/52 calibre tracked self-propelled gun system is also under induction. Developed by L&T in conjunction Hanwa Tech Win (HTW) of Republic of Korea (ROK), the K9 VAJRA-T is a variant of K9 Thunder capable of withstanding 14.5 mm armour piercing rounds, 152 mm shell fragments, and anti-personnel mines; main armament of 155 mm/52 caliber; maximum firing range of 40 km; mobility range of 75 km and; CBRN protection. In September 2015, L&T emerged as sole qualified bidder and finalist based on the performance of the K-9 Vajra-T; the 4,500 cr ($800) million contract being for supply of 100 howitzers to the Indian Army. The MoD had given the contract to L&T in May 2017. Under the contract, L&T was asked to deliver 100 guns with over 50% indigenous components, in 42 months. Under the contract, L&T is delivering 25 guns now. 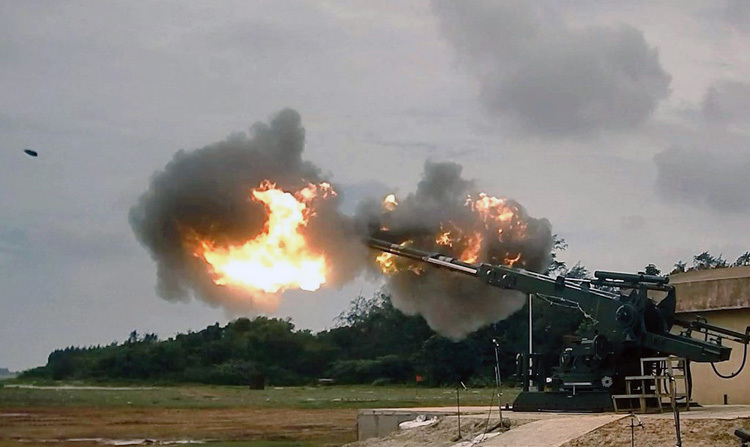 On August 25, 2018, the Defence Acquisition Council (DAC) chaired by Defence Minister approved procurement of 150 x 155mm/52 calibre Advanced Towed Artillery Gun Systems (ATAGS). The ATAGS have been developed indigenously by the DRDO partnering with Bharat Forge Ltd, Tata Power SED and Mahindra Defense Naval System under the’ Make in India’ initiative. Acquisition cost of 150 ATAGS will reportedly be around $490 million although contract for their acquisition is yet to be concluded by MoD. Development of ATAGS having commenced in 2013 was completed by March 2017 and user trials have been continuing since. Six prototypes of the ATAGS have been manufactured to date. ATAGS is a howitzer gun capable of firing five rounds in short duration with an effective range of up to 40 km, depending on the ammunition type. Given its light weight, it is well suited for deployment in mountainous regions. ATAGS will supplement the indigenous ‘Dhanush’ which is 155mm/45 caliber artillery gun, Dhanush, an improved derivative of the FH-77B 155 mm/39 calibre Bofors, 414 quantity of which India acquired from Sweden between 1987 and 1991. In 2014, prototype of Dhanush was made ready for user trial and evaluation. But trials were marred by incidents of misfires. First, the shell burst within the barrel. Subsequent rounds of trials were held successfully but again during user exploitation in 2017 there were two incidents of muzzle hits, which led to a further set back. The incidents were reported to be due to ammunition problems and not the gun though doubts naturally rose about metallurgy of the barrels. The ammunition too is produced under aegis of the OFB, and there have been hosts of complaints of faulty ammunition over the years with different types of weapons. After internal trials at Balasore range in Odisha during March 2018 by the GCF, the guns were again presented to the Army in first week June. The trial firing continued for five days and with no incident reported, the OFB hopes that the army would finally clear the weapon system. On June 7, 2018, Dhanush completed the final round of user exploitation trials with a full battery of six guns firing 300 rounds at Pokhran ranges. No major issues were reported during firing and as per the OFB, accuracy and consistency of the guns were exceptional, and the guns are ready for induction into the Army. The gun has been developed by Gun Carriage Factory (GCF), Jabalpur comes under the OFB, with latter under the Department of Defence Production (DoPD) of MoD. Dhanush reportedly has maximum effective range of 38 km in salvo mode, capable of firing eight rounds per minutes and needs crew of six to eight. Dhanush was reportedly declared ready for induction in June 2018 but the contract is yet to be signed by MoD. 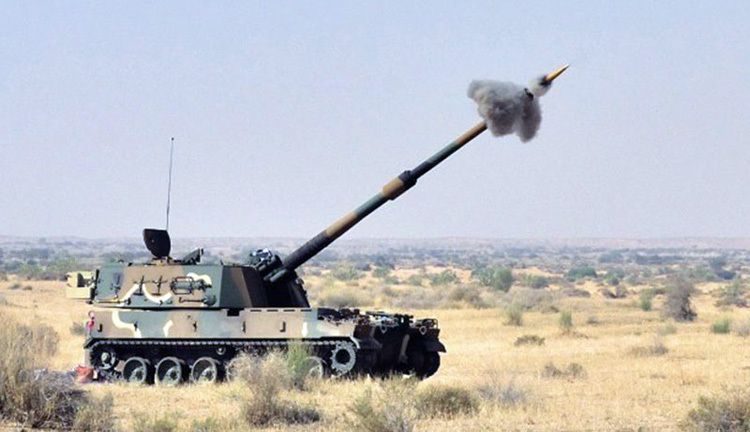 The Army reportedly wanted to order 114 x Dhanush howitzers in the first batch this year. 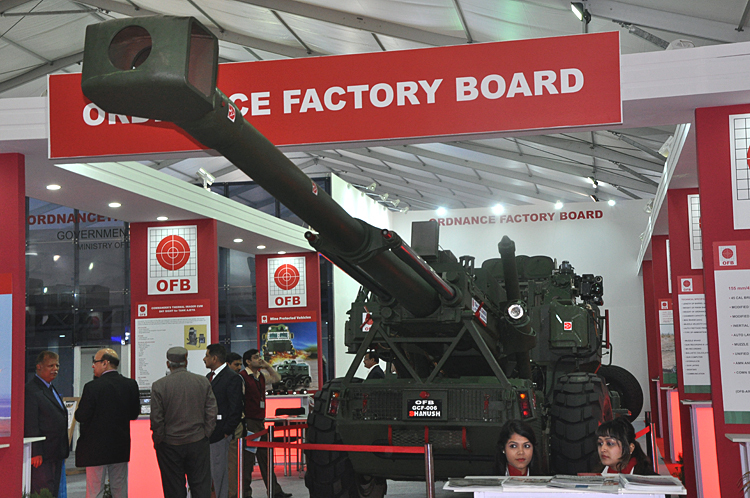 DRDO expects MoD to order a total of 414 Dhanush howitzer guns. An upgraded variant of the Dhanush howitzer gun, designated Dhanush Version 2 (V2) with a larger calibre (from 45 to 52mm) and a slightly increased range of 42 km is currently under development. Overall fielding of these guns and howitzers will take considerable time, but once completed, it will increase the firepower of the Army substantially.